Meg Whitman expands on the future of WebOS - more tablets?! 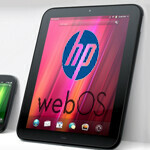 As we reported earlier, after an all-hands meeting this morning HP announced it would open source WebOS. At the time they stayed mum on the fate of WebOS employees and the potential for future hardware products. Now HP CEO Meg Whitman has conducted a sit-down interview to flesh out HP’s goals. Whitman confirmed that HP hopes to produce more hardware. When pressed she suggested that a return to tablets would probably be their initial foray, although she warned that it would likely be late next year or 2013 before anything was announced. Putting WebOS on printers and even appliances has been mentioned in the past, but apparently those applications will take a back seat for now. Whitman categorically ruled out a return to the smartphone market. Plans for the WebOS team were also clarified. HP is going to undertake a strategic analysis to determine the best way to manage WebOS; Whitman specifically used the analogy of running the WebOS division like a start-up. Whether managing the open-source WebOS will be done with a Mozilla-like foundation or some other model has not yet been decided. Whitman confirmed that HP would like to keep as much of the WebOS development team together as possible, although she noted that the new vision for WebOS is quite different from the original strategic goals, so some employees may naturally seek other opportunities. All in all it appears that HP is taking this quite seriously – a refreshing outlook, as open sourcing is sometimes a way for companies to wash their hands of a product. Whitman said HP will be committing significant resources to the ongoing development of WebOS, and will be creating a 4-5 year road map, rather than expecting a miraculous shift in market position in the next year or two. The future for WebOS is still murky at best, but at least it appears there will be a future. Viva la Palm! so phone arena is reneging the previous article which declared "no hardware"? at least webOS lives on in some form. WebOS is gonna be awesome when the hardware really catches up to the software. "....Whitman specifically used the analogy of running the WebOS division like a start-up." If anything gives me any hope for the future of WeBOS, it is that statement. HP needs to look at it as a start-up. There is room for WeBOS o gain traction, but they are starting from basically nothing but failure. So, they better look at it as building from the ground up. I still wonder if there is any real chance for them to get this right. I can't help but feel as though this great OS has run it's course. "Whitman confirmed that HP hopes to produce more hardware." I just read the Engadget article on this and it said that Meg Whitman said that there would be NO hardware produced (i.e. phones AND tablets) in any foreseeable future and that she only hoped to keep the software alive. So, who's right here? HP should just stop. Really. This is embarassing. They put all this money and work into launching the Touchpad, pull it off the market 6 weeks later, keep their lips sealed for 4 months, then announce they are going to give it another go but it will be at least a year before they have their plans fleshed out. W...T...F! Here's an idea HP, 2 or 3 Skus, not based on amt of memory and otherwise are the same, a $250 or less Sku to compete with Kindle Fire in 7-8 inch size, not a loss leader like that one but a slim profit meant for pushing this out to first time tablet owners, a $400 Sku to be similar to whatever the Ipad specs are like and similar size in an attempt to give more for the money, and maybe a premium $600ish Sku which will be better than the usual tablet varieties we see in some way (bigger screen, better cameras, better speakers, better cpu and/or graphics, or maybe some premium feature we dont see in tablets like glasses less 3D, usb ports, etc I dunno they are supposed to be the ones to think of this crap) if non Apple tablets start taking off well to be for a power user. And having Micro/SD card support would be a great thing, as you can save on the amt of internet memory you put in the device and leave that cost to the user, so you get more profit, thus a $250 ish tablet with slightly better specs than the Kindle Fire could still make you about $20-30 profit, which will of course get eaten up from non manufacturing costs, but make some great accessories and you'll be fine. Gol-ly Son . . . You said a mouthful ! . .